A hard splice is achieved by looping the rope back on itself, inserting a galvanised metal thimble and then interweaving the rope to make a secure join. This is the strongest way of introducing a loop into a rope and enables easy hanging to garden posts or suspending from a branch in a tree. The thimble acts as a reinforcement to the splice and will help to prevent wear if a rope is run through it. Please select from the size ranges below noting that we can only hard splice up to 32mm. 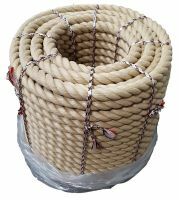 Hard splices are not currently available for our braided or plaited ropes. The image we have used shows a hard splice in a 12mm synthetic hemp rope.